Understanding your skin type is vital to choosing the right products and regimen for a glowing complexion. For example, if your skin is oily, applying too-heavy moisturizers can clog pores and lead to acne breakouts. Conversely, dry skin can suffer if not moisturized properly. So how do you know if you have oily skin, dry skin, or somewhere in between? Keep reading to learn how to find your skin type. What Determines My Skin Type? Your skin type is influenced by a number of factors, but genetics are the number one determinant of your skin type. For example, if your parents have oily skin, you’re likely to have oily skin as well. However, external influences can come into play. Climate, weather conditions, diet, medications, and hormones all play a role in how skin behaves. This is why some people actually experience a different skin type in the winter or the summer, or why your products can suddenly stop working when you go on vacation in a different climate. The most common skin types are oily, combination, and dry. While everyone’s skin is unique, most people will fall into one of these categories. To determine your skin type at home, wash your face with a gentle cleanser and pat dry with a soft towel. Do not apply any lotions, serums, or moisturizers. After two hours, take note of how your skin looks and feels. If your skin feels tight or parched, you have dry skin. Shine on the nose and forehead indicates combination skin, while shine all over the face signifies an oily skin type. 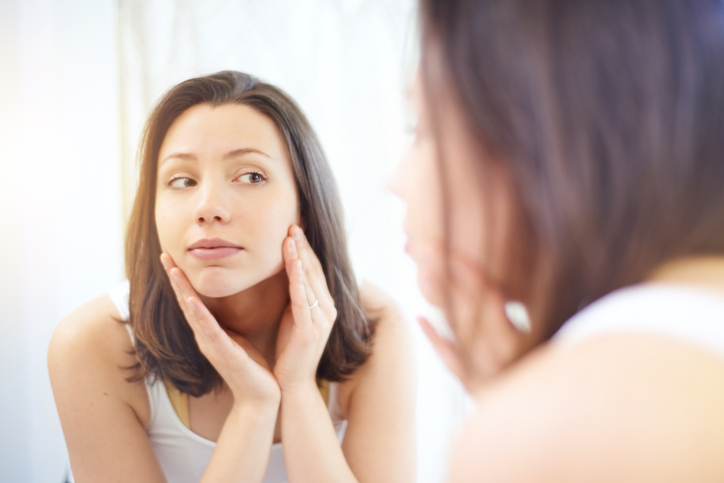 Oily skin is more prone to clogged pores and breakouts than other skin types, but it’s also the most resistant to the development of fine lines and wrinkles. Those with oily skin will want to exfoliate regularly to keep pores clean and acne-free. Steer clear of harsh cleansers and acne treatments, as these can signal oily skin to produce more oil. Dry skin feels tight and is more prone to fine lines and flaking. However, dry skin types rarely experience acne breakouts. It’s important to exfoliate dry skin several times per week to remove the layers of dull, dead skin. Exfoliation also allows nourishing serums and moisturizers to penetrate the skin more deeply. Make sure to wear a hydrating night cream each night, since the skin tends to lose moisture while we sleep. Combination skin has an oily forehead and nose with dry cheeks. Exfoliation is also important for this skin type, as it will help to balance oil production throughout the face. Using a toner like witch hazel on your t-zone will also help to control sebum production. Use a heavier lotion on cheeks to keep them hydrated, and a lightweight gel moisturizer on the forehead and nose to prevent them from getting too shiny. Remember: skin types can change based on the season or other external factors. If your skin care regimen doesn’t seem to be working, test your skin type again and make adjustments to your routine according to your results. What is your skin type? Let us know in the comments!